Faith Muthambi has been defending a Broadcasting Digital Migration policy and amendments that were approved by Cabinet, the DOC says. Communications minister Faith Muthambi did not go against the African National Congress' (ANC's) Broadcasting Digital Migration policy, says her department in a statement. 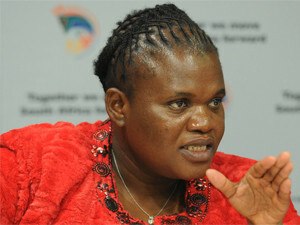 The Department of Communications (DOC) has lashed out at suggestions that Muthambi defied her party's directive by adopting to use unencrypted set-top boxes (STBs) for when the country migrates from analogue to digital television viewing. According to the DOC, it is "very concerned about the misinformation and innuendos peddled in the media, some of which are unfortunately attributed to Dr Blade Nzimande, a member of Cabinet". Last week, Eyewitness News reported that higher education minister Nzimande said Muthambi defied the ANC and alliance decisions on digital terrestrial television (DTT). In 2013, the ANC resolved to use encrypted STBs for the country's migration; however, Muthambi made amendments to the party's policy on the type of STBs that would be used for the digital migration process. Nzimande told the news agency he was aware that Naspers and DSTV have been lobbying behind the scenes on the issue of the type of STBs to use for digital migration. "We know that Naspers and MultiChoice have been lobbying very hard, but I'm not saying it's as a result of that lobbying that [she] has done that. But we know that they have been lobbying very, very hard in order to keep their monopoly. That's why monopolies are dangerous. "It's very unfortunate that it's the SCA [Supreme Court of Appeal] that must reinstate what was originally the position of the ANC," said Nzimande. The department, however, has lambasted Nzimande for his comments. "To either expressly or by implication allege that minister Muthambi has gone against the ANC policy on digital migration amendments is patently untrue. Furthermore, it is disingenuous and a veiled attack on the integrity of minister Muthambi to seek to suggest that the minister may have been successfully lobbied by any group of interested parties," reads the DOC statement. It adds: "The truth of the matter is that the minister of communications has been defending a Broadcasting Digital Migration policy and amendments which were approved by the Cabinet." The public spat between Muthambi and Nzimande is not the first time the communications minister has faced backlash from a member of the ANC on the use of unencrypted STBs for digital migration. Last year, the party's Jackson Mthembu called out Muthambi over the amendments made to the Broadcasting Digital Migration policy, saying the use of unencrypted STBs was not part of the ANC's mandate. Despite the approval by Cabinet, Muthambi's decision to amend the Broadcasting Digital Migration policy was challenged in the courts by Etv. The free-to-air broadcaster approached the courts to have the provision that says government subsidised STBs would not have the capability to encrypt broadcast signals set aside. Etv argued that government subsidised DTT decoders should have the capability to support encryption. Last month, the SCA ruled the communication department's Digital Migration Policy on the use of unencrypted STBs for digital migration was "unlawful and invalid". The SCA judgment notes the amendment to the policy did not follow a process of consultation, and was irrational and in breach of the principle of legality. In the statement, the DOC says "encryption is not required for free-to-air broadcasting or free-to-air DTT set-top boxes; it is a pay-TV technology". Referencing a statement of a Cabinet meeting on 4 March 2015, the DOC states: "Cabinet approved the Broadcasting Digital Migration Amendment Policy with the inclusion of the control system in the set-top box, which will be clearly defined when the policy is published." "The government position as regards 'encryption' is that there be a control system to prevent the sale of government subsidised STBs outside of the borders of South Africa, and such a control system has been put in place," reads the statement. It continues: "It is not the position of government to subsidise commercial players, by putting in place encryption for conditional access, which is a pay-TV technology. Government and the policy has been very clear that if parties want to do this then it is at their own cost. "It is unfortunate that the two types of encryption have been conveniently confused and conflated to undermine the Cabinet position and isolate minister Muthambi," reads the statement. The department's statement further reiterates that the SCA ruling only repealed a single clause in the Broadcasting Digital Migration policy. "It is not clear why minister Nzimande has singled out MultiChoice lobbying on this issue, as Etv has also been lobbying just as hard, as have manufacturers and other entities in civil society. "In making a policy decision, the minister considers all submissions that are made and then, in concurrence with Cabinet, determines what is in the public interest," says the DOC. "It is quite unfortunate that expedient agendas undermine not only the intentions of the judiciary, but also those of Cabinet," concludes the department's statement. Although it remains unclear whether the minister will appeal the SCA ruling, her department has remained defiant and notes it will continue driving registration for STBs for qualifying households. "The Supreme Court of Appeal has not ordered the reversal of the Broadcasting Digital Migration policy, or interdicted the implementation of this key national project," says the DOC in a statement. According to Etv attorney, Aslam Moosajee, who is a director at Norton Rose Fulbright, the broadcaster understands the communications minister plans to appeal to the Constitutional Court, but in the meanwhile, "we trust USAASA will comply with the Supreme Court of Appeal judgment and will ensure the subsidised set-top boxes that it is rolling out will have encryption capability". While SA began its digital migration process in the border-lying areas in December last year, only 823 STBs were installed by the end of February, according to the latest statistics. SA missed last year's International Telecommunication Union 17 June deadline for migration.